Info and images of all of the Ship Parts can be found here. Ship Parts are pretty easy to come by, and there are five ways Link can get them. 1) Purchase the ship parts from Beedle or the various island shops. 2) Use the salvage arm to bring up sunken treasure from the ocean ground. 3) Find them in various treasure chests all throughout the overworld and temples. 4) Some of the various mini-games will award ship parts for getting high scores. 5) Trade ship parts with various people via Nintendo Wi-Fi. Playing through the main quest of the game will get you quite a few ship parts, but if you are trying to complete the game with all the ship parts, you are going to need to do some extra work. Beedle's shop will constantly be selling ship parts, but sometimes they can be quite expensive. Even if you have reached VIP status and get 40% off on your purchases, they can still be pricey. Alternatively, you can go with salvaging treasure from the ocean. Link will collect many treasure maps as he goes through with his quest and each treasure map has a corresponding sunken treasure. Many of which have a end reward of a ship part. For a complete listing of all the sunken treasure, take a look at our Treasure Maps page. 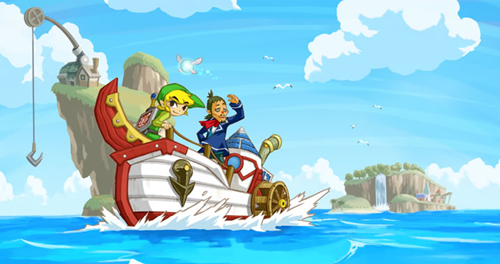 Also, in certain parts of the Great Sea, Link will bump into large pirate ships. If Link is able to sink a large ship before the pirates ambush you, than the ship will sink to the bottom of the ocean floor. A red x will appear on your map, showing another sunken treasure that holds a ship part. If you have already completed the game, or at least already have the Phantom Sword, there is another way you can go about finishing your ship parts collection. In all of the floors within the Temple of the Ocean King, Link gets an award if he defeats all the Phantoms. If Link can get rid of all the phantoms on floors B7, B8, and B9. Also, after Link has defeated the phantoms on floor B13, he access the Stairway to Bellum. He can return to the main entrance of the temple and battle through the entire temple once again. This time after reaching the stairway to Bellum, he will be rewarded with two treasure chests that contain ship parts. All of the ship parts that you get are completely random, so how do you get exactly the ship parts that you need? Well, by trading of course. 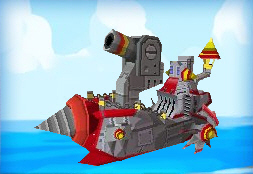 The game allows players to use Nintendo DS Wi-Fi capability to trade ship parts and treasure with friends all around the world. What you need to do in order to begin the trading process, is to meet up with Freedle, the instrument playing dude at the top-right of Mercay Island. If you don't know how to reach him, refer to section 8.1 within chapter 8 of the Phantom Hourglass Walkthrough. There are two methods that you can actually trade ship parts online. Tag Mode is the simplest way to go if your friend is nearby. Either place a ship part in one of the three boxes near freedle while you are in game, or in tag mode. Then go to tag mode and if there is somebody nearby also in tag mode, the ship parts will be traded. Battle Mode is the other option of trading ship parts. Once again, place the ship parts in one of the boxes near freedle. After you setup and complete a multiplayer match with an online friend, the ship parts will be traded. The game has to end and if one player quits out early there will be no trade. The outcome of the match is irrelevant, as the parts will be traded regardless. Link can also sell back ship parts at the treasure teller's hut on Mercay Island. Much like when Link is purchasing ship parts, the prices are complete random. The only exceptions are the golden ship parts and the standard ship parts that come with Linebeck's ship. The initial ship parts that come with the ship cannot be sold at the treasure teller's hut. The golden ship parts will always be pricey when purchasing them, and they will always sell for 1,500 to the treasure teller. The rest of the ship parts will sell for 50, 150, 800, or 1500 rupees. To customize your ship with all the ship parts that you have received, head on over to the shipyard, which is right near the dock on Mercay Island. The shipyard worker will swap your ship parts however you'd like. You can view your ship at this point as well. Mix & Match to find the coolest looking and strongest combinations. There are eight different ship sets that are available. Matching more of the same ship parts on your ship will give it better health when Link is at sea. Linebeck's ship begins with a health bar of four green hearts. Below is a quick chart of the effect of using the same ship parts. 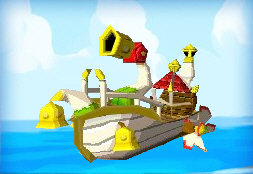 The complete golden set will allow the ship to have a maximum health bar of eight green hearts. Below is a complete listing of all eight of the ship sets, with names, descriptions, and images of the parts. Passable Prow - An average prow that came equipped on the S.S. Linebeck. Normal Anchor - The S.S. Linebeck came equipped with this average anchor. Standard Hull - The original hull of the S.S. Linebeck. Nothing special. Eddo's Cannon - A cannon bought from Eddo for the high price of 50 rupees. Simple Handrail - The handrail that came stock on Linebeck's ship. Steady Bridge - The original bridge of Linebeck's ship. It's a common style. Normal Chimney - The normal chimney that came with Linebeck's ship. Normal Wheel - The paddle that came stock on Linebeck's ship. It... works! Bell Prow - This bell doesn't chime, but it gives the prow a nice look. Bell Anchor - A modern, bell-shaped anchor. Ironically, it doesn't ring. Bright Hull - A modified hull from a standard ship with a fancy yellow spot. Artistic Cannon - A cannon with truly avant-garde design. Catches the eye! Arch Handrail - It draws attention for its playful and ornate design. Restful Cabin - Soothing design offers an escape from the stresses of battle. Elegant Chimney - A simple shape, but something about it is so enticing. Paddling Wheel - A wheel with bent paddles. It steams your ship along! Drill Prow - Broken, and nobody in the world has the parts to fix it. Iron Anchor - An iron-spiked anchor that can secure a ship in any storm. Iron Hull - Looks strong and heavy. Too bad it's neither. Strong Cannon - Very functional, but it's not very different from other cannons. Chain Handrail - A handrail forged with hefty chains so it won't break easily. Conning Tower - A bridge designed for those engaged in battle day after day. Parasol Chimney - A chimney made of iron. Caution: Gets very hot when used! Screw Wheel - A wheel rumored to have been made from a battleship screw. Mermaid Prow - The design was based on eyewitness accounts. Ancient Anchor - An anchor shaped from the mold of an ancient statue. Stone Hull - A hull that looks like an ancient stronghold. The deck is so green. Ancient Cannon - A cannon surrounded with the glory of an ancient age. Pillar Handrail - Made from pillars of exotic ruins. It was recently recovered. Peaceful Bridge - With its temple-like serenity, it offers peace and comfort. Stone Chimney - A chimney once used by a bread baker. Smells fresh-baked! Stone Wheel - Legend says it was made from a giant's table, but no one knows for sure. Log Prow - Made with waterproof lumber, so it's surprisingly valuable. Swim Ring - It is what it is... No one knows if it works as an anchor. Vintage Hull - A worn, rugged hull with a manly, burly style of its own. Meager Cannon - Looks like it could break easily, but it's sturdier than it appears. Worn Handrail - In dire need of repair, but its design adds a lot of flavor! Barrel Shack - A modest design for the environmentally conscious! Strange Chimney - Looks a little like garbage, but that's its main appeal! Simple Wheel - The number of paddles was cut to four to simplify it. Demon Prow - A prow adorned with a scowling demon, Very... intense. Sickle Anchor - An anchor made in the image of an evil sickle. Scary! 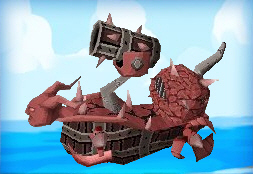 Demon Ship - A scary ship said to ferry the foulest of evils. Fear Cannon - Some suspect it can fire cannonballs of pure malice. Spiked Handrail - A handrail made of sharp thorns. Actually not a handrail at all. Demon Prison - A prison designed to cage the foulest villains! Demon Chimney - This chimney is said to have been attached to a pot used for boiling lava! Insect Wheel - A wheel made from the hollow shell of a red insect. Ewww! Tropical Prow - A prow made with swaying palm trees in mind. No coconuts. Shell Anchor - An anchor made from a shell. Girls go wild for it! Tropical Ship - A themed ship with the appeal of a private tropical oasis. Seapony Cannon - A seahorse-shaped cannon. Very fairytale-like, but it's powerful. Wood Handrail - A very basic handrail. Sometimes the basics are the best! Shell Apartment - Top creature comforts combined with the small of ocean air. Horn Chimney - An artistic chimney filled with rustic charm. Shell Paddle - Aesthetic design made from an ancient spiral shell. Tourist Prow - A prow made for those looking for the romance of the sea! Weighty Anchor - A three-pronged anchor. No frills, but it gets the job done! Dignified Ship - A hull with a very serious red and black paint scheme. Red Cannon - Looks complex, but it's easy to use. The professional standard. Utility Handrail - A handrail that works even in violently churning seas. Practical Bridge - Created for those who live their years on the high seas. Tall Chimney - Towering over the horizon, all chimneys aspire to its glory. Red Wheel - A wheel with nothing special. That is what draws many to it. Golden Prow - An extravagant prow that uses an expensive golden pot. Gem Anchor - An anchor patterned after a gem. A sure hit with celebrities! Golden Hull - A hull that delivers an experience in pure extravagance. Golden Cannon - The perfectly designed cannon. Truly the gold standard. Golden Handrail - Note the elegant curve and design. A true masterpiece! Golden Bridge - A bridge for royalty. The interior is also gold and the bed is super-fluffy. Golden Chimney - A simple chimney, but its surfaces gleam mysteriously. Golden Wheel - The skilled craftsman's love can be seen in the details. ©Dungeon Gaming Enterprises, LLC 2001-2013. All rights reserved.